This photo is the reason why you should NEVER buy a cheap inkjet printer…. 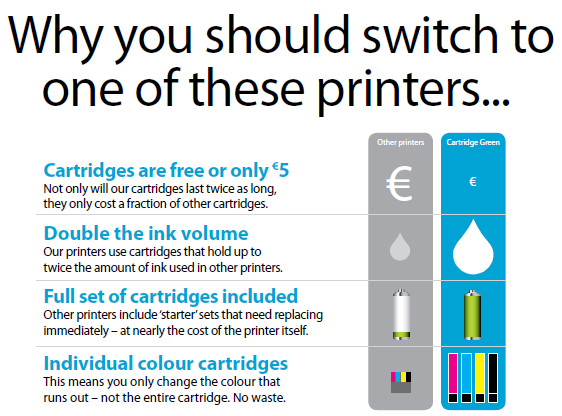 But unfortunately we get people in our shops every day telling us that they bought a “cheap” printer but that the cartridges run out very quickly, printing only a few pages and costing almost as much as the printer to replace! To prove the false economy that is a “cheap” printer, we bought one from a well know electrical retailer. The printer brand was very well known and it only cost €89. It was wireless and it scanned and copied – on the face of it an affordable printer price with decent functionality. So we opened the cartridges and extracted all the ink into syringes. 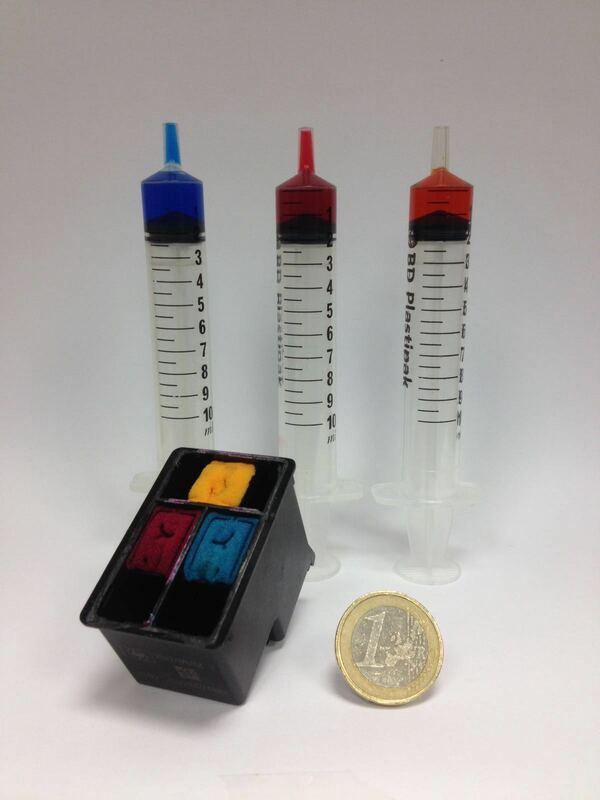 There was just under 2ml of ink in each colour chamber – pour 2ml of water into an egg cup to see how little that is! The best independent price we got to replace the colour cartridge was €38 for a branded version and €29 for a reasonable quality non branded version. Now compare the replacement price with the number of pages the cartridges prints to see how “cheap” the printer is now! So if you need a new printer, avoid the “cheap” option that will cost you small fortune in the short, medium and long term. If you’ve fallen into the trap already and have a “cheap” printer recycle it or give it to someone you don’t like AND then switch to a printer from Cartridge Green that’s comes with FREE UNLIMITED INK!